To enter our Farm To Table Dinner drawing, please fill out the form below in its entirety, and click submit at the bottom of the form. 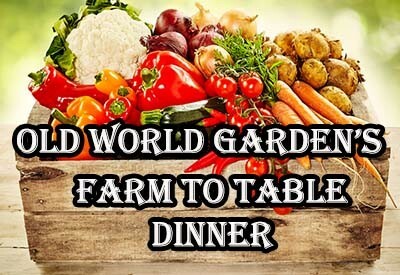 The dinner will be held on September, 2nd, 2017 at 5 pm at Old World Garden Farms. There is no charge for this dinner. We will notify all of those selected via email by Sunday, August 6th, 2017.